Other than congratulating the new Governors, reviving the Loss Crew is also an very important task. More details regarding the EMC & ICU’s rule can be viewed at the Swimming Pool’s Event Center. As such Secretary shall be explaining the rules and usage of the Medical Certification to revive Loss Crew in Governor of Mafia event. Leaders that did not win the current Governor, kindly don’t be discouraged and look forward to the next time event! 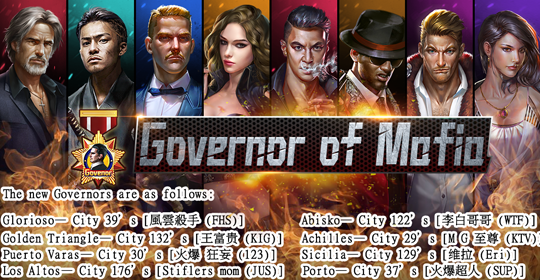 The 4th Governor of Mafia event will begin its Preparation Phase after 28 days, in which even more Cities will be joining in the events! Battle will only get more exciting, extreme and heated! Leaders can use this time to become stronger and anticipate the arrival of the 4th Governor of Mafia event!